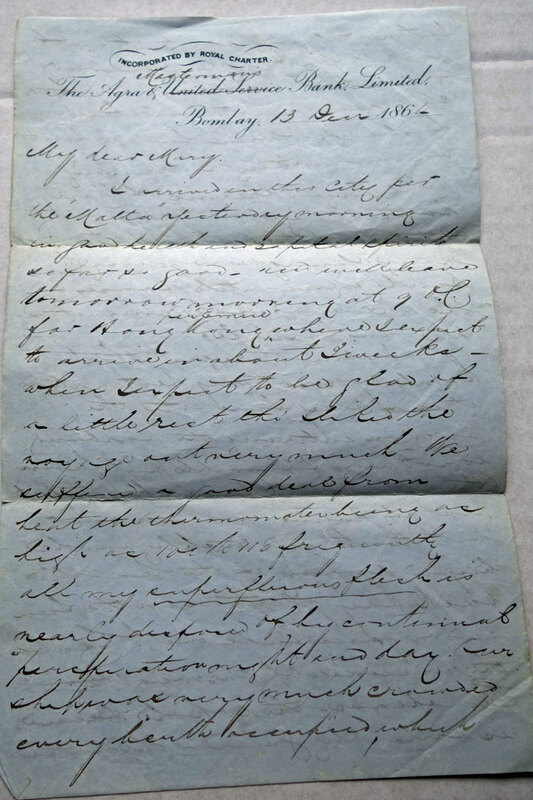 On November 12th, 1864, a month before Thomas Jackson wrote this letter to his sister Mary, he had signed a contract with Agra and Masterman’s Bank to work in Hong Kong. He had received £137.10 for Passage Money and Travelling Expenses. Before seeing this letter, all I had to go on - with respect to his experience of the trip to Hong Kong - was ship’s manifests, traveller’s diaries, weather reports and the like. My research would have been pretty threadbare had it not been for significant help from Peter Stanes of New Zealand. Thankfully, all his research also agrees with the details in this letter which has been made available thanks to Christine Wright of Gilford Castle. · Thomas Jackson left London shortly after November 12th, 1864. It seems that he took the ferry from Dover to Calais, and then the train to Marseilles. Having signed his contract on November 12th, he had plenty of time to get to Marseilles for the November 20th P&O sailing that was part of the Overland Route to Hong Kong. · November 20th, 1864. He sailed from Marseilles on board the P & O steamer Ceylon. It was built in 1858 - by Samuda Bros, of London and was a fully rigged steam/sailing vessel used on the Southampton-Malta-Alexandria service. It was about 306 feet long and 41 feet wide. SOURCE: Allen’s India Mail for November and December 1864, page 922. NOTE: “Our” Thomas Jackson is not to be confused with the Mr. Jackson who sailed on the Rangoon and who was mentioned on page 9 of the January 6th, 1865 edition of Allen’s Indian Mail. · November 23rd or 24th at Malta, and then November 27th or 28th at Alexandria. NOTE: According to the P&O handbook, it usually took 2 ½ days to get to Malta, and then 3 1/2 more to arrive at the port of Alexandria. · November 29th, 1864 (estimate – he could easily have arrived a few days earlier) He would have taken the train from Alexandria to Suez - the final links of the railway connecting Alexandria and Suez had just been completed five years earlier. In total, the trip from Marseilles to Bombay usually took 22 days. Since he left Marseilles on November 20th & arrived in Bombay on December 12th, this estimate of a total of 22 days is a fit for an uneventful voyage. It would include approximately 8 days from Suez to Aden and then 8 more days from Aden to Bombay – weather depending. · December 12, 1864. A T. Jackson arrived at Bombay, on board the P & O steamer Malta, a month after leaving Marseilles. It was an older steamer ship, built in 1848. As reported in the January 6, 1865 edition of Allen’s, it had started from Suez. Thomas’ letter of December 13, 1864 agrees with his name being amongst the arrivals listed on page 9 of the January 6th, 1865 edition of Allen’s Indian Mail. More detail from Peter Stanes: The reference is on page 9 of the 6 Jan edition of Allen’s Indian Mail which you can find from the following link: Allen’s India Mail Vol XXIII, 1865. You will see that the reference is to “Mr Jackson”, not “Mr T Jackson”. However, I am sure that this is the same person because the other passengers named are the same as those in the 21 Nov 1864 list. · December 14, 1864 Thomas Jackson left Bombay at 9:00 AM on the Emeu. · December 25th, 1864. A letter that Thomas Jackson wrote on January 14, 1865, mentions spending Xmas day at Galle as part of an eight day stop-over in Ceylon (now Sri Lanka). · January 14, 1864. Arrived at Hong Kong at 8:00 AM and began work 1 ½ hours later. PAGE THREE NOTE: It feels as if a page may be missing. They were not numbered. be content for the present and hope that some first-rate thing will turn up in China – I spent yesterday evening with the Bank’s fellows. 3 of them have a bungalow and live in a style really magnificent. A sumptuous table, saddle horses, and a Carragh – the servants do evening [???] & wash the clothes and fold them every night. Coffee in bed at 6:00 AM. At Bank at 8 and breakfast at 9. With all this style they live on £200 a year it would cost more in England – Of course if they lived separately it would cost them far more and they would not live as well. I am quite ignorant of Home news and often wonder how you are all getting on. I trust to find a letter at Hong Kong on my arrival. You cannot have any idea what a treat it is to get a letter here, the Mail is one of the greatest events possible. Since I left Belfast I have seen a great deal of the world and I have to say that I have been in Europe, Asia and Africa in it is probable that I will see the other 2 Divisions of the world before I see dear old Ireland. last night. The cool air, and the stillness of night tempted us into the Verandah. The leaves of the trees appeared covered with Silver, the rich foliage gently waving up and down, the full moon and stars with the truly beautiful Eastern sky pleased the eye; while the ear was pleased with the noise of the sea, as wave after wave broke on the shore immediately below us. Everything considered I think Bombay a delightful place to live in, and I trust yet to have that pleasure. The P & O steamer Malta. A few months earlier, the ship had been delayed to 19 days because of a cholera outbreak in Suez, but this voyage passed without mishap. The P&O Steamer the Emeu was launched in 1853, and in 1880 was lost in the Macassar Strait when on a voyage from Manila to Montreal with a cargo of sugar. Fortunately, this voyage was uneventful even though it had broken down a couple of times in 1863 and had to be towed into safe harbor. It was a little over 266 feet long and was 36 ½ feet wide. SOURCE: P&O Emeu Fact Sheet. NOTE: The Emeu was also used at this time for transporting chests of Malawa opium, I have been unable so far to determine the name of the Captain on this voyage. It actually took a month – probably because of the 8 day stop-over in Ceylon, for which no reason was given. He arrived in Hong Kong on January 14th, 1865. NOTE: Thomas Jackson was 6’2” tall – a challenge for sleeping in the five foot long bunks found on such ships. It would seem going from the passenger list that the surgeon was Dr. Grant. I do not yet know who this was. Rev Dr. Daniel Gunn BROWNE (1808-1892)– his uncle and life time mentor. Most likely his cousin Elizabeth Johanna DONALDSON (1854-1903), daughter of John DONALDSON (1818-1854) and Elizabeth Johanna JACKSON (1817-1900). Great-Aunt Barbara DONALDSON née BRADFORD (1783-1865). I suspect that either she or her daughter or both were responsible for covering the fees for Thomas Jackson’s schooling at Morgan’s School in Dublin. His close relationship with this aunt included significant conversations on matters of politics, finance, and religion.